From the heartland of the United States, Prairie Organic Vodka is a clean, smooth, and affordable vodka that is worthy of any bar. The corn-based vodka is certified organic, GMO-free, and gluten-free, leaving you with a feel-good vodka perfect for your favorite martinis and other vodka cocktails. From the corn to the stills to the bottling, Prairie is both organic and eco-friendly. The distillery has taken many steps to significantly reduce the environmental impact of its production. Plus, Prairie has expanded their portfolio to include an organic gin and cucumber vodka, both of which live up to the distillery's standards to produce a fresh, clean taste. 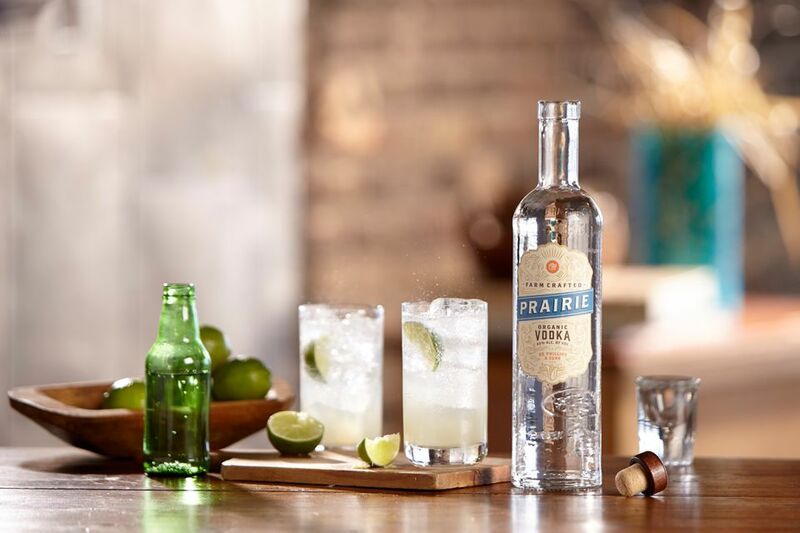 Prairie Organic Vodka is produced by Phillips Distilling Company, makers of the famous line of UV Vodkas. This is an entirely different liquor portfolio, though. You won't find any flashy colors or artificial flavors in Prairie Organic Spirits. It's as clean as vodka gets. First launched in 2008, the entire production process of Prairie Organic Vodka is certified organic by the USDA. It begins in the fields of west-central Minnesota, where a co-op of organic family farmers takes great care in growing the corn organically. No chemicals—pesticides or herbicides—or artificial fertilizers are used in the fields and the seed has not been genetically modified. Beyond the fields, the distillation process is designed to be as “green” as possible through practices such as reducing waste and recycling, seeking out better water sources, and lowering energy usage. Using locally grown grains that are made into a mash and fermented before heading to the distillery cuts the fuel usage of production, for example. After production, the distiller's dried grains are then used as feed on the farms from which the corn originated. The vodka is "distilled to taste"—meaning there is no set number of distillations as seen in other vodkas— and produced in small batches before being bottled at 40% alcohol/volume (80 proof) in recycled glass. It sells for around $20 a bottle, so it remains affordable for the average consumer who is conscious of the environmental impact of the products they buy. Quite often, organic products are a lot of hype but they leave something to be desired when it comes to the taste. That's not so with Prairie Organic Vodka. It's a clean tasting vodka that is equal to its other premium, organic counterparts. This vodka is luscious, almost creamy and rich, with a clean corn flavor. It has a smooth finish that is equally bright, leaving you wanting more with each sip. It's a very mixable vodka as well, adding depth to drinks that you cannot find with many other vodkas. Prairie Organic will stand up to any vodka cocktail you want to mix it in and shines best when paired with fresh, natural ingredients. Try it with sugar snap peas in the green giant or in a watermelon martini. You'll also enjoy it in vodka favorites like the vodka tonic and cosmopolitan. Since it doesn't have a high price tag, Prairie Organic is also an excellent choice for homemade vodka infusions. Overall, it really is an excellent choice for eco-friendly bartending. The clear vodka may be Prairie Organic's flagship bottle, but the distillery has put its green practices into making two other spirits that are worth checking out as well. Both are priced at $20 as well, so you won't break the bank in your trials. You'll enjoy the cool, crisp taste of their cucumber vodka on hot summer days. It's a great way to add a hint of flavor to cocktails like the vodka collins and is another fabulous choice for newer recipes like the celery cup no. 1. Prairie Organic Gin is also a delight to drink. Sage is one of its primary ingredients, which pairs wonderfully with gin's signature juniper, as well as the distillery's blend of other botanicals. This isn't a bold gin, like London dry gins, but has a softer profile that follows the trends set by brands like Hendrick's and Aviation. It's another great option for vodka drinkers who want to dabble in the more flavorful spirit. Try it in any gin cocktail; it makes an excellent martini, gin and tonic, and gimlet.